Just the idea of fried, breaded zucchini sticks gets my mouth watering! But if I want to keep my daily Weight Watchers Points low, then those yummy fried delights are a definite no-no. So in an effort to create low calorie fried foods recipes, I’ve been doing a lot of experimenting and coming up with some really tasty and healthy recipes. The one that I’ll share today is a Faux Fried Zucchini Strips Recipe. Yes, they’re not really “fried”, they are baked, but they still taste amazingly good and, in my opinion, have much more flavor than the fatty fried version. 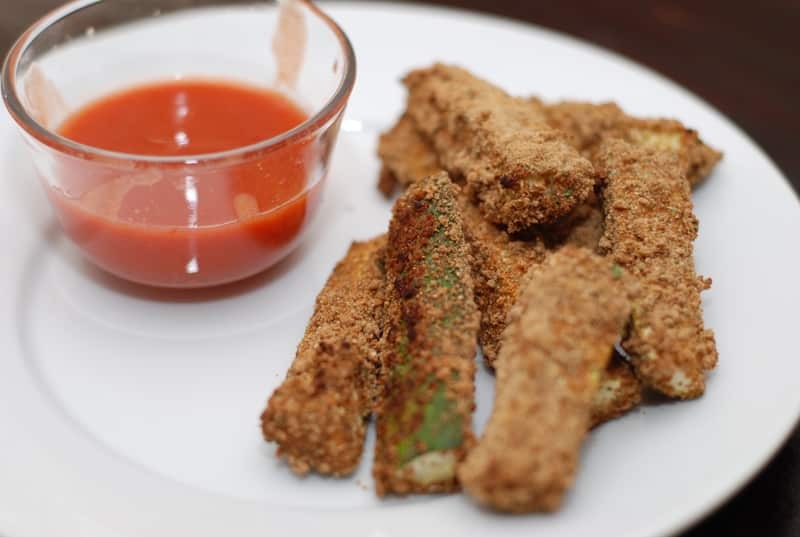 Though this is not an official Weight Watchers Zucchini Sticks Recipe, anyone who is a weight watcher trying to eat healthier and still enjoy good food will definitely enjoy this 1 Point appetizer recipe. Enjoy! Preheat oven to 425 degrees. Slice each zucchini lengthwise, and then cut each half lengthwise again. Now, cut each strip in half. This should make a total of 16 sticks. Pat dry with paper towels and set aside. In a food processor or blender, process the Fiber One Cereal until it becomes a breadcrumb like consistency. Combine the cereal mix into a small bowl with onion powder, garlic powder, paprika, salt, and pepper. In another small bowl, pour in the egg whites or egg substitute. To bread your sticks, dip each zucchini stick into egg whites and shake off excess. Then dip into cereal mixture and coat all sides of strips evenly. Continue until all zucchini strips are breaded. Spray a baking sheet with no fat cooking spray and place all the breaded zucchini sticks onto the baking sheet. Pop into the oven and cook until sticks start to brown – about 15 minutes. Serve with 2 tbsp marinara sauce for no additional points! I’m not sure why everyone is complaining, this isn’t difficult or expensive at all. This sounds wonderful! Can’t wait to try it out. I made these and to me and my opinion are disgusting. I cannot wait to try all the wonderful recipes I am finding on your site! This one included! I have bad reactions to aspartame and Fiber One cereal lists that as one of their ingredients. Can you suggest an alternative to using Fiber One cereal…something without aspartame?